Is Hollywood coming back to College Hill? Do you remember seeing movies at the Hollywood Theater? You may soon have the opportunity to do so again. The year was 1923. A new gem was opening up in College Hill, bringing a little bit of Hollywood to the big screen in the Cincinnati neighborhood. It was called the Hollywood Theater. "The original streetcar that Cincinnati had, it came right past it," said Michael Cappel, president of the College Hill Community Urban Redevelopment Corporation. "So it ran up Hamilton Avenue and turned around at Hamilton and North Bend where College Hill Station is going. That was the turn around, the terminus for one of the original street car lines." The Hollywood Theater was one of the biggest attractions along Hamilton Avenue and at the center of the College Hill business district. "Dress shops, there was a furniture store. I mean it really was a downtown in and of itself for a very long time," Cappel said. "It was a community that was diverse by choice for a very long time." Long-time College Hill resident Tim Sexton said he has fond memories of going to the neighborhood theater. There was a Graeter's across the street and a pizza establishment next door, and matinees cost just 25 cents. One movie stands out in his mind. "The Magnificent Men in the Flying Machine," Sexton laughed. "I don't know why. I really loved it at the time. It was a fun movie for me and I saw it twice in one week." At some point, the fun times turned into hard ones. In the '90s, Hamilton Avenue suffered the loss of a number of businesses. The Hollywood was one of them, and its former home became a church. 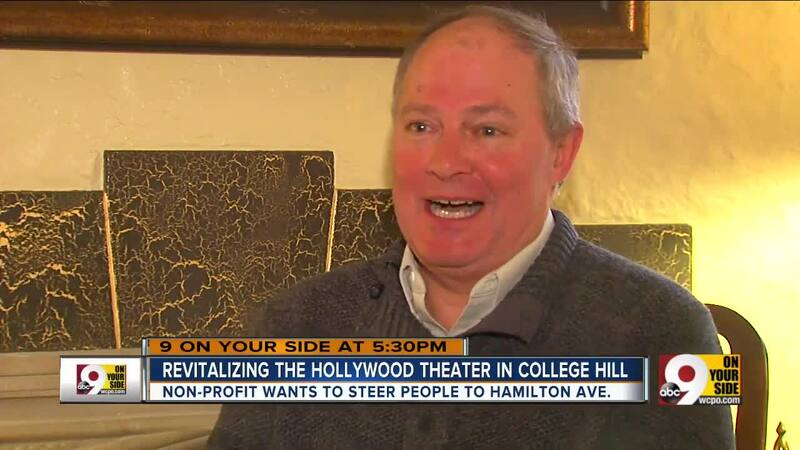 Last year, however, the College Hill Community Urban Redevelopment Corporation bought the former theater back. Cappel said the group hopes to turn it back into a major College Hill attraction. "We don't know if it's going to be a theater component or how we're going to best utilize this cool old building," Cappel said. Whatever it is, he wants it to become an establishment that draws people to the neighborhood. "We want people to think of College Hill as one of the places they want to go on a Friday and Saturday night," Cappel said. "So they want to come to a great restaurant, they want to come out to have a great drink, they want to come out to watch a movie or a play or whatever it may be." Renovation costs were estimated around $12 million. The development will include three adjacent buildings, which will be turned into 19 apartment units, and the College Hill Urban Redevelopment Corporation will work on determining a use for the nearly 100-year-old Hollywood. Cappel said they will apply for historic tax credits through the state and federal governments. Residents like Sexton want the former movie house to have an appeal that will last for decades. "What I see happening is what I want to see happening," Sexton said. "But, again, that's not as important as what other people younger than I want to see. That's the important part because they'll be the future." Throughout 2019, 9 On Your Side will bring you stories about transportation and regional growth as part of a series called "Move Up Cincinnati". You can comment or send us your story ideas to moveupcincinnati@wcpo.com.